College can be a challenging time to engage in healthy nutrition for many reasons including but not limited to the following: being new to residential settings and dining hall experiences; an unfamiliarity with American or mid-Atlantic food traditions; academic related stress; time management; generalized stress; physical illness; food allergies or specific dietary needs; or previous eating/ food issues. It is normal to struggle with figuring out to eat healthy and nutritious foods during college. 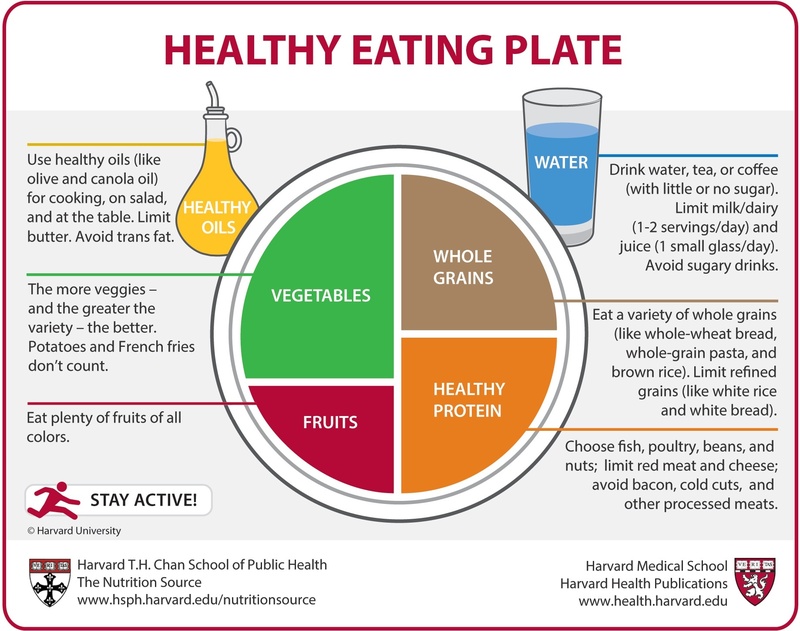 The Healthy Eating Plate, a nutrition guide created by the Harvard School of Public Health and Harvard Medical School, was designed to provide "detailed guidance, in a simple format, to help people make the best eating choices." What you believe about your own appearance (including your memories, assumptions, and generalizations). How you feel about your body, including your height, shape, and weight. How you sense and control your body as you move, and how you feel in your body, not just about your body. We all may have days when we feel awkward or uncomfortable in our bodies. In order to develop a positive body image, we must learn how to recognize and respect our natural shape; how to overcome negative thoughts and feelings; and how to focus on body positive and affirming thoughts. Negative body image is a distorted perception of your shape--you perceive parts of your body unlike they really are. You are convinced that only other people are attractive and that your body size or shape is a sign of personal failure. You may feel ashamed, self-conscious, and anxious about your body. You may also feel uncomfortable and awkward in your body. Positive body image is a clear, true perception of your shape--you see the various parts of your body as they really are. You celebrate and appreciate your natural body shape, and you understand that a person’s physical appearance says very little about their character and value as a person. You feel proud and accepting of your unique body and refuse to spend an unreasonable amount of time worrying about food, weight, and calories. You feel comfortable and confident in your body. People with negative body image have a greater likelihood of developing an eating disorder and are more likely to suffer from feelings of depression, isolation, low self-esteem, and obsessions with weight loss. If you want more information about eating disorders or how to help yourself or a friend, connect with National Eating Disorders Association or contact any of the people listed below. Brittany Pizio, Nutritionist specializes in eating disorders and weight management, as well as medical nutrition therapy for a variety of concerns including diabetes, GI issues, anemia, and issues frequently affecting young adults. Please email bpizio1@swarthmore.edu to schedule an appointment. Eating well requires planning. Here are a few tips for planning a healthier diet. Eat enough calories for the day. Very low calorie diets can have side effects like fatigue, constipation, nausea, and diarrhea. Eat a wide variety of different, nutrient rich food. Fiber is an important part of any diet. Candy and other sweets are considered empty calories as they provide fuel but are non-nutritious. While less fat is better for your health, some fat is essential for your health. Choose a lean cut of meat for protein. Try not to add salt or sugar to your food or drinks. Try and avoid fried foods or cut down on how often you eat them. Read packaging and try to choose foods that have fewer ingredients if it comes packaged. Eat no less than twice a day. Eating more often is fine. If you are craving sweets, eat fruit for dessert instead or as a snack. The body needs water. While there is little scientific evidence that 2.5 liters of pure water is necessary, dehydration is a significant issue especially as the weather gets warmer. Signs of dehydration include fatigue, loss of appetite, flushed skin, heat intolerance, light-headedness, dark-colored urine, dry mouth or dry cough. Here are ways to stay hydrated. Drink before you are thirsty. Thirst may indicate you are already dehydrated. Water is best, but your body can absorb water from a well balanced diet that may include caffeine and juice. Drink water before, during, and after physical exertion. If you are exercising more than an hour or are outside more than a few hours, replace lost electrolytes by consuming sports drinks. Alcoholic and caffeinated beverages (coffee, teas, and colas) tend to pull water from the body and can promote dehydration. Try adding lemon, lime, cucumber, or herbs to your water for enhanced flavor without adding sugar.